A star feeds gas into a nearby black hole’s accretion disk. Image courtesy of StarDate. Outer space is teeming with unusual phenomena, from brown dwarves to globular clusters. But none have captured the public imagination quite like black holes. Born from the collapsed remains of gigantic stars, these cosmic bodies have nearly infinite density. They take up little space, but their gravitational pull is unrivaled in strength. Their sheer mass deforms space and slows time. At any point past a black hole’s innermost boundary, or event horizon, nothing can escape — not even light. And if that sounds unbelievable, read on: black holes get even stranger. The phrase “black hole” is both dramatic and memorable, but it is not entirely accurate. Black holes are not the shadowy voids portrayed in science fiction — in fact, they produce tremendous amounts of radiation. This is because black holes act more like drains than like magnets. Matter caught by their pull is not pulled directly inward; instead, it circles around as if caught in a whirlpool. 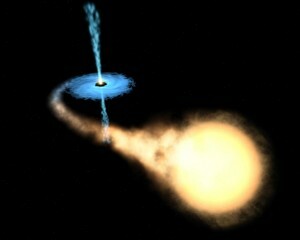 This swirling process traps large amounts of stellar gas, spinning it around the black hole at high speed. The result is an accretion disk: a rotating field of imprisoned gas particles whose movement produces great friction and strong magnetic fields. In turn, these forces produce X-rays which we can detect on Earth with our instruments. 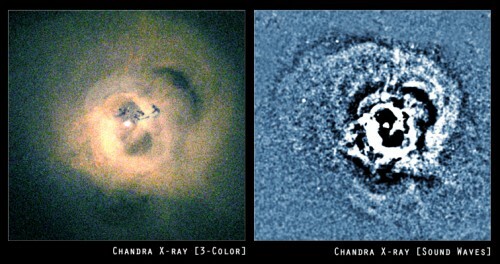 These X-rays allow us to see “black” holes, brightly and clearly. 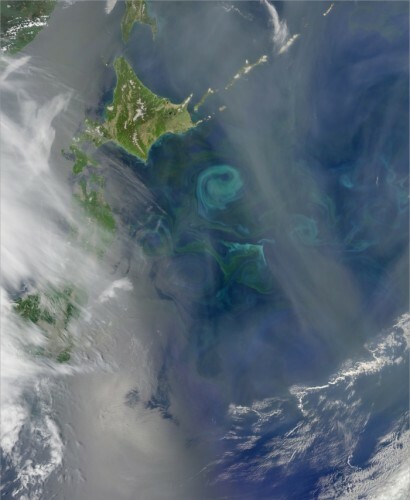 Satellite image of massive eddies near Japan. Image courtesy of NASA. To our instruments, black holes are far from black, and research suggests they are also far from silent. Black holes exert an incredibly powerful gravity field, which pulls in stellar matter at nearly the speed of light. Such fast-moving matter gains a tremendous amount of energy, and this energy does not vanish past the event horizon. Instead, as an object is pulled into a black hole, the energy of its motion is transformed into sound. We cannot hear these sounds, as space is silent, but we can “see” them with our telescopes. Sonic waves emerging from a black hole produce ripples in the accretion disk, and by analyzing these ripples, we can determine their frequency. Incredibly, black holes produce the deepest “notes” in the universe — 57 octaves beneath middle C.
X-ray image of a black hole’s sonic vibrations. Image courtesy of NASA. Because they need “food” to survive, black holes are far from picky eaters. Their gravitational fields attract anything with mass, and nothing is more massive than other black holes. When two of these giants collide, neither is consumed. Instead the two merge, and become even larger. This kind of fusion produces the greatest black holes of all, the behemoths we call “supermassive.” These black holes are so large — and their gravitational fields so strong — that their accretion disks spin like particle accelerators. Matter whirls around the event horizon at half the speed of light. Thankfully for us, black holes are restricted to deep space, not on or near Earth. But the oceans produce surprisingly similar phenomena known as eddies. Formed when currents bend back on themselves, eddies are “islands” of water swirling in the middle of an ocean. Small eddies, like the “whirlpools” formed by a canoe paddle, last only a few seconds. The largest can be hundreds of kilometers wide and may survive for years at a time. Like black holes, these gigantic eddies draw in and collect anything that approaches, trapping it until they disintegrate months later. Eddies also create their own “accretion disks” of water spray, which floats above the current but does not fall in. Cover Image: A telescope captures gas jets emerging from a supermassive black hole. Image courtesy of NASA.